Designed to take their breath away, this 18ct white gold 1/4ct diamond cluster ring features a stunning collection of brilliant cut diamonds set in four claws of white gold. Diamond pieces for your wedding day. 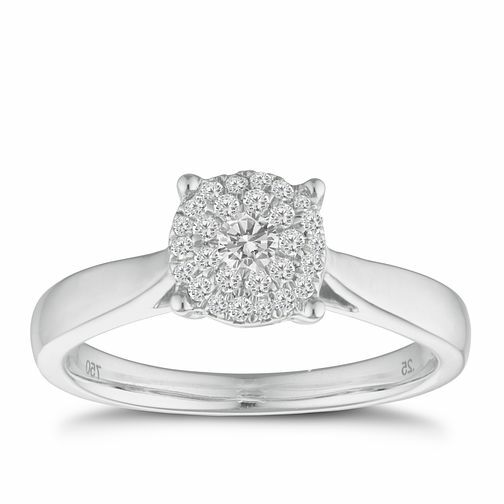 18ct white gold 1/4ct diamond cluster ring is rated 4.3 out of 5 by 9. Rated 5 out of 5 by Anonymous from Stunning ring After looking at so many different styles my partner found this one on a trip to Liverpool. I was eager to try it on and loved it the minute it was on. Lovely size diamond not to over the top. Had so many nice comments about it. I'm really pleased with his choice. Rated 5 out of 5 by Anonymous from Finally found the perfect ring We went shopping on Sunday for an engagement ring. I tried on what I thought I wanted but after many different styles of ring, none were shouting that's the one! Until my Fiancé said to try this one. I didn't even think about this style but the minute I put it on I knew it was the one. A beautiful ring! Perfect sized ring for my finger and beautiful and sparkling.. Richard at the Middlesbrough store was fantastic, we ordered the ring for delivery yesterday but the order went through as a store delivery instead of a shop delivery, Ernest Jones head office managed to change the delivery address so it could be delivered to my work. When the ring arrived, it was packed as if it was for the store and not the customer, I rang the Middlesbrough store and told them that there was no box and within a couple of hours Richard came to my office on his day off to deliver me the box and all the packaging! Best Customer Service every received by a shop. Thank You Richard for making my day :-) I wont tell my fiancé that the ring has now gone in the sale! Oops.. Again, Thanks so much for going that extra mile for us, I handed him the box when I got home and he got down on 1 knee and proposed again. Just Perfect.